FAT BUT FIT: IS THIS ACCEPTABLE FOR PEOPLE WITH HIGH BLOOD PRESSURE? High blood pressure, readings above 140/90 mmHg, affects one in three Americans and increases risk for heart disease, stroke, and kidney disease. This condition will cost the US over $75 billion in 2010! A recent study published in the American Heart Journal evaluated data from 35,000 patients, mostly white men, collected over a 20 year period. 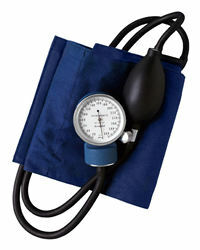 The doctors focused on blood pressure, fitness level and body composition. The people who were overweight or obese had a higher systolic (top number) blood pressure as was expected. Interestingly, the fitness level of these individuals had little impact on their blood pressure readings. The study found that only people of normal weight seemed to gain a positive benefit in blood pressure readings depending on fitness levels. The authors suggest the possibility that fitness alone cannot overcome the negative physical effects of being overweight or obese. Based on these findings, weight control should be the number one focus of people trying to lower their blood pressure and increasing physical fitness should be a secondary goal. HOWEVER, this does not mean that regular exercise is discouraged! Research has shown that overweight but fit individuals aren’t any more likely to die from heart disease and stroke than thin, fit people. So, exercise does have an overall benefit for long term health and well being. This article only focused on blood pressure, which is one risk factor for heart disease and stroke. The bottom line is the ultimate goal is to maintain a healthy weight and include exercise in your daily routine to obtain the best fitness level possible!!! You are currently browsing the Healthy Hearts & Bodies with Heartstrong blog archives for the day Thursday, August 5th, 2010.